I don't know what kind of winter weather you're experiencing in your neck of the woods, but ours has been brutally cold for nearly a month. It's the kind of cold that reminds me of my Air Force days in the Upper Peninsula of Michigan. OK, it's not really that bad, but it is the kind of cold that calls for a nice hot bowl of hearty soup. Corn chowder is a beautiful and glorious thing. 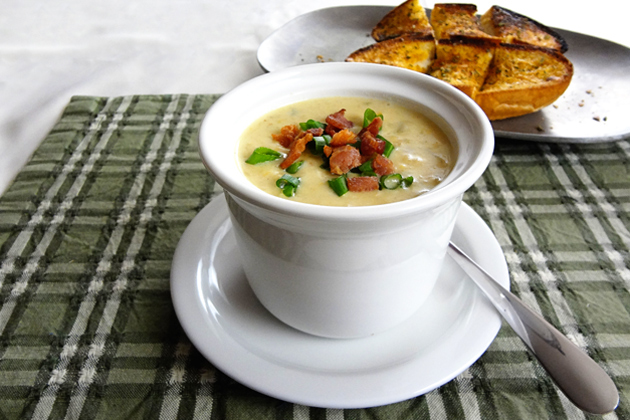 It's rich, thick, creamy, and of course corny, with just a hint of bacon. What's not to like? I've made many versions over the years, but I usually just wing it. This time I decided that I'd actually document a recipe, so here goes. It's very simple, and very good. 5 slices Thick cut bacon, chopped to 1/2"
Heat a large pot over medium heat. Add the bacon and cook until it's just starting to crisp (about five minutes). Drain off half of the bacon fat, add the leek and cook two minutes. Add the wine and cook five minutes longer. Add the remaining ingredients to the pot, bring just to a boil, then reduce to a simmer. Cover and let simmer 45 minutes, or until the potatoes are tender. Adjust the seasoning as desired. Serve with some crusty garlic bread and enjoy! We've had an ice storm all day, schools out and businesses closed. So yeah, it's been soup here too, 4 days out of 7. This corn chowder seems rich with all that milk, just right up our alley. Chris - It's rich, but not as rich as it would appear based on the ingredients. Let me know what you think.